Losing a pet is an owner’s worst nightmare. 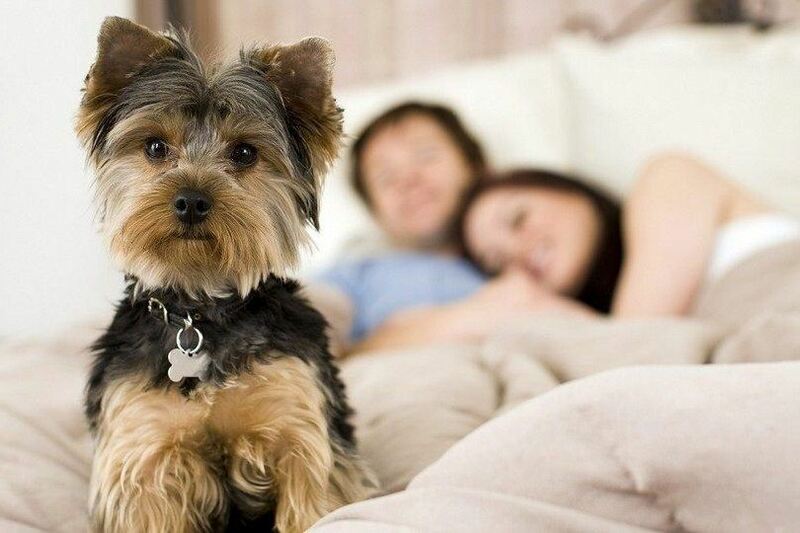 As a responsible pet owner, you have resources and options available to you so you can keep your dog safe. Not only can you take steps to prevent your dog from getting lost, you can also make it easier for you to find your dog if the worst were ever to happen. Read through this article and find out about ways on how to keep your dog from running away and getting lost. Even though collars and nametags play an important role, which we mention again later, getting dogs microchipped is a common procedure now that greatly increases your chances of finding your pet if they get lost. Collars and nametags can get lost (or removed if your dog is stolen), but a microchip is embedded under the skin and lasts a long time. Plus, you can easily get a microchip for your dog at the vet while your pet it neutered or spayed - it only takes a few seconds. A study found that a dog is 2.4 times more likely to make it home if he is microchipped. Micro-chipping your dog will set you back anywhere between $20 to $100 dollars, depending on where you have it done, and it is a pain-free and simple procedure. It is important that you check with the company to make sure that the microchip holds the right information though, since it isn’t always input correctly the first time and that could be an obstacle to finding your dog if he or she gets out. You may also want to check out our best GPS dog collar blog post. Clip collars are unsafe and are known for breaking when tugged on by a strong dog. Most owners recommend collars with buckles. Owners should also get used to having their dog’s collars on all the time, in case they run out the door when it opens or your home in broken into. We assume our pets are always safe when we are home with them but you never know what could happen and the easier it is for people to identify your dog and get ahold of you the higher the chances you will get him home sooner. Nametags are just as important as a collar. The dangling ones are easy to see and if they are well-made they can last a while. Make sure the nametag is metal and your dog’s information is engraved on it. You should include your dog’s name and preferably two phone numbers, or an email address. People can be hesitant to put their personal information on a nametag (like their address), so whatever way people can contact you so you can get your pet back is ideal. Try to include contact numbers and/or email addresses that you know will be monitored/answered. One good way to help make sure your dog never gets lost is to walk them on a leash. 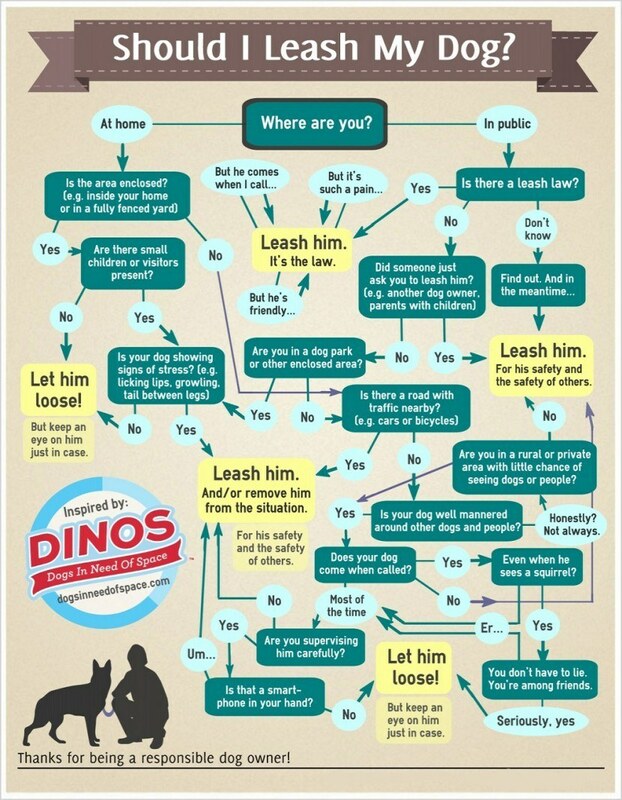 Check out this handy and humorous flowchart to help you make more responsible, and safer choices for you and your dog. 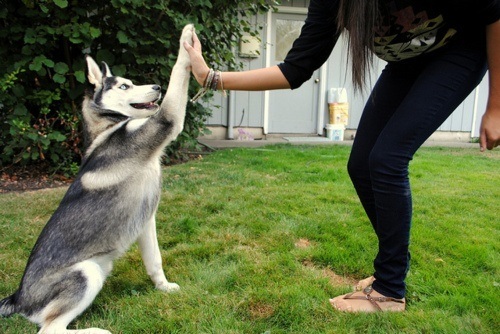 Yes, dogs are smart and through proper obedience training they can learn to walk very well without a leash! It’s very cute to see dogs who are so well-behaved walking alongside their owners, even with other dogs and distractions around. Unfortunately, unexpected things do happen and even the most well-trained dog can potentially get separated from its owner while on a walk. The best way to avoid a dog getting lost or running into traffic is to keep the dog on a quality leash and collar. If your dog isn’t spayed/neutered they might have some hormonal issues going on. If your dog is known as an escape artist in your household, your dog may be trying to get away because of the instinctual need to reproduce. Getting a dog neutered helps calm this response and keep your dog happy at home, if you keep them exercised and their needs are being met they will be less likely to try and bolt when you open the door. If you let your dog outside in a fenced-in yard, that is great. They get to run around and expend their energy, but it is up to you to make sure that the fences are secure and high enough so that your dog can’t jump over. You should also make sure that your dog can’t dig a hole to escape while you aren’t looking either. Check out our related blog post on: how to stop a dog from digging up a garden. 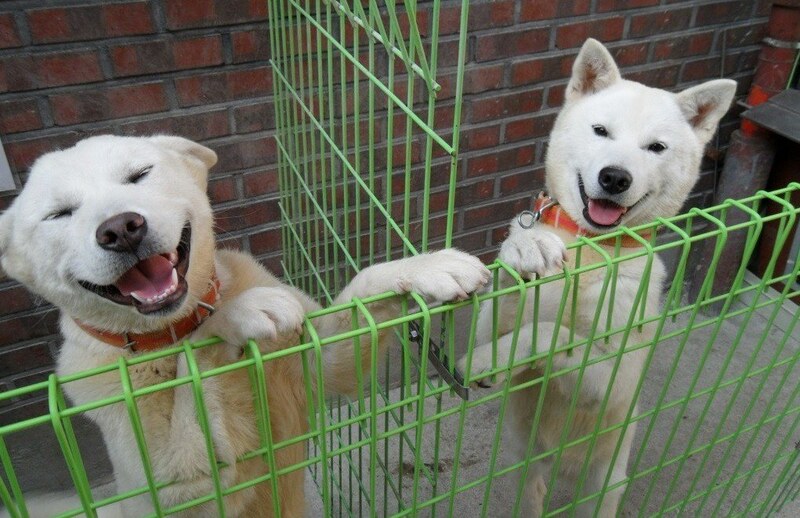 Dog are smart and a dog can learn to open some gates, so it’s important to install one that is doggy-proof if needed. Regular checks to make sure that gates, fences, and locks are intact can help make sure a dog doesn’t get lost by accident. Making sure your dog gets to exert its energy and tire itself out will help you train a happy, fulfilled dog. In addition to walks, your dog should be exposed to different exercise, games, and socialization with other people and animals regularly. A dog who is confident and engaged in all these things will be happy in his environment and secure. Your dog will be less likely to bolt if they are using their energy in a healthy way and are stimulated throughout the day. Pungsans, the real Houdinis, are well known for their stamina. You shouldn’t leave your dog unsupervised - especially outside - for long periods of time. If you do, there are outdoor kennels that can keep your dog secure if you buy the right one. TIP: Check out our Best 5 Outdoor Dog Kennels post. A dog can easily dig a hole or even chew holes through a fence if they are left outside all day. Make sure that when you are away your dog is secured and if possible have someone come check on your dog during the day. A solid foundation of training is essential. Training your dog is a key step in preventing your dog from getting lost in the future. A dog on a walk might see a squirrel that catches its interest and slip away from you, but if your dog knows its name and responds to basic commands like, “Come!” and “Stay!” you can prevent your dog from running away altogether. Getting a license for your dog is another method that makes it easier for your dog to be found if they are lost. You don’t want your dog getting lost in a shelter system, and licensing your dog makes it easier for you to identify them if they are found and brought somewhere. Keep current information available on your dog for posters and to contact vets and shelters. This information could be useful for someone who spotted your pet and let people know whether your dog is safe to approach if they are found. 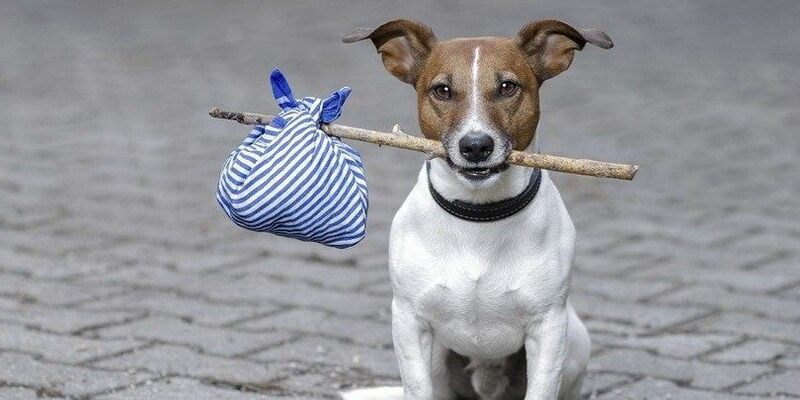 If you do these things your dog’s chances of getting lost will be much smaller. Your chances of finding your dog if they do happen to get lost will also be much higher. No owner wants their furry companion to go missing, so make sure you are responsible and do everything you can to make sure that doesn’t happen. Do you have any tips on how to keep your dog from running away? Share your tips in the comments below.